May was Historical Preservation month. 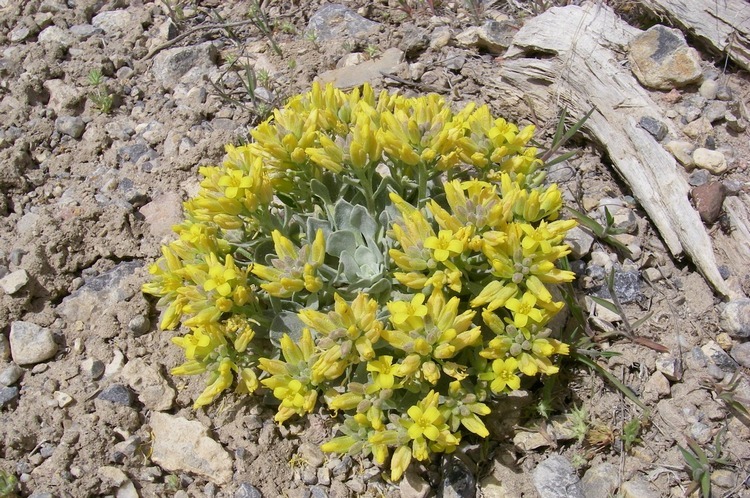 I spent most of it preparing the new edition of The Complete Nevada Traveler for the printer, and in the process I was struck by the way the old Nevada is slowly — and not so slowly — disappearing. 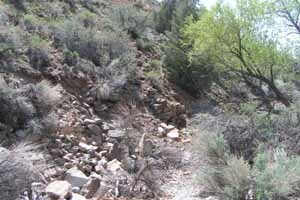 The tumbledown remains of the Grosch brothers’ cabin in American Ravine, Silver City. It has been happening for many years, and it happens in big ways and small. In Reno and Las Vegas, landmark structures are being demolished. In Silver City a rock wall fell down. Granted, both the Mapes Hotel in Reno and the Stardust on the Las Vegas Strip, the most recent landmarks to be scraped away, were beyond redemption as profit centers. They had become old and in the way, preventing the high-priced real estate they occupied from realizing its prime purpose, and so they had to go. Generations of memories went with them. 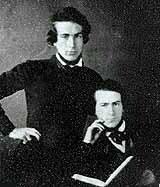 But before they could record or develop their claims, Hosea drove a pick through his foot and died of blood poisoning. 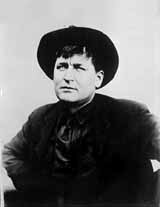 Allen then struck out on foot for California, but was caught on the Sierra by winter snows and died of exposure. Their little cabin had been left in the care of Henry Comstock, “a lazy, drunken prospector” (as one historian described him), who took possession of their possessions, including a trunk containing documents and correspondence. These papers were never brought to light, and it was Comstock’s name that was attached to the great discoveries of gold and silver that followed: the Comstock Lode. The back wall of a neighboring cabin remains intact on Main Street, Silver City. As the mines were developed, Virginia City soon became the greatest city between San Francisco and Denver, Gold Hill was renowned for its rich mines and Silver City, which took form just uphill from the Grosh brothers’ crude cabin, attracted over 1000 residents. The little cabin, long abandoned, fell into disrepair. Its wooden parts were doubtless scavenged by other miners to burn for heat one freezing winter. 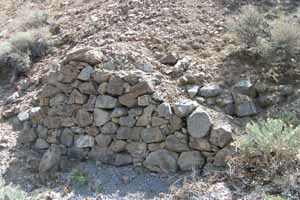 But through the years of bonanza, and the borrasca that followed, as the generations succeeded one another, the significance of the stacked rocks was forgotten. No plaque, no-one left to remember. Yet the wall remained intact. Until last spring, when it tumbled down into a heap, and the last remaining handiwork of the men who located the Comstock Lode became just a meaningless jumble of rocks. Around the state there are many historic treasures that are being protected, restored and revived. But at the mouth of American Canyon a big piece of our history was lost when that little wall came down. Nevada has lost one of its best. Gene Kaplan has died. Dozens of friends and family turned out to pay respects and bid farewell to Gene Kaplan of Wells. Here’s how his friend and fellow townsman Thad Ballard remembered him that day. He and his wife Peg moved to Wells from San Francisco and immediately began to invest themselves in the old city on the northeastern frontier. They bought the defunct El Rancho Hotel, lived upstairs and put the downstairs to use for public meetings and private events, bought several of the historic buildings on Front Street, including the iconic Bulls Head Bar, cleaned up the facades and began restoration. He did deep research and put informational placards on each of the old structures, providing visitors with a pleasant and instructive promenade as they read of the San Marin Hotel, the Elite (pronounced in properly contrarian Nevada fashion as ‘Ee-light’) Saloon, the Goble Market, the Mint Saloon, the Soya Lung Chinese Merchandise store and more. Scotty learned brother Warner had gone north leaving him pretty much on his own at age 11, although arrangements had been made with a Front Street hotel to board him. Soon thereafter Scotty met a girl named Katie and together they sold milk and doughnuts when emigrant trains stopped in Wells. At least one Front Street restaurant operator resented their competition and made it ‘unpleasant’ for the two entrepreneurs. Seeking revenge to back off those pressuring him, Scotty waited until passengers were almost finished eating, then opened the restaurant door to shout, ‘All Aboard!’ That caused patrons to jump up and run out without paying. We had a great time at Jim Butler Days. On Friday night, we joined quite a few durable locals and attended the street dance. It was cold temp (it was probably in the high 40s to low 50s). I know it wasn’t too cold because my kids still ate some snow cones. Also, I was able to wear my traditional Tonopah garb that consists of shorts, sandles with socks and a parka. 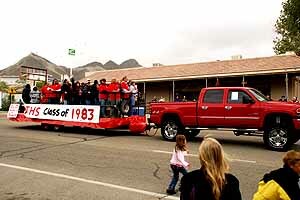 After that, my wife and I joined many local alums from all the classes of the 90s (include the classes of 83 and 88 that were having reunions) at the Tonopah Liquor Company. We caught up and heard the usual variety of hilarious Tonopah tales. I’ve never before seen so many beards and hats in one room. At the parade on Saturday a.m., despite the actual rain on the parade, we all had a great time. The historic Mizpah Hotel was a wonderful backdrop to the planes flying overhead and many of the local businesses participated in the parade. The Otteson Torquoise mining company (of the Travel Channel fame) had a team of period-dressed folks on horses and mules. 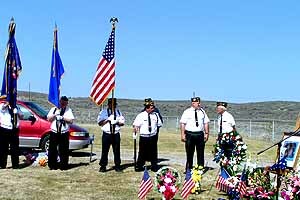 There was also a group of Pahrump Gunfighers that were displaying their firearms. 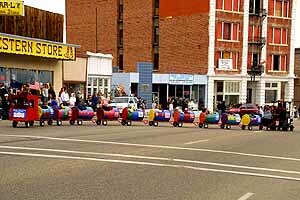 My wife was riding with her class in the parade and my kids caught a Halloween-like load of candy. 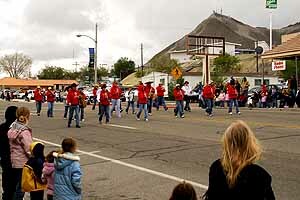 Later on Saturday, many of the unique Tonopah style events started. For example, there was a fundraiser that involved paying your money in order to get a chance to beat a mini van with a baseball bat. They also had an arts and crafts show at the Convention Center. As usual, they had the mining contests. Unfortunately, I thought they were cancelled due to the rain but I later found out that I was wrong and that I had just gone to the wrong park. Anyway, we had lunch in the packed El Marquis Mexican Restaurant. It was refreshing to see the place has the same owner today that it had 20 years ago. Later, we were treated to the class of 88 reception at the Elks Lodge. Jennifer Klapper ran the show and was able to get local Elks, Kal Boni and Chris Larue, to be our hosts. They did a great job. From there, we went down to the Karaoki contest at the Convention Center. Things seemed to be going really well but then I decided to get involved since I was not able to get into the mucking and mining contests. I sang Takin’ Care of Business. That promptly emptied the place. When the music was over, everyone, including the DJ, was gone. It was tough for me to figure out where everyone went but I later found them hiding from me in a local watering hole. On Sunday, there was a light snow on the mountains around town. It was beautiful and a real treat for my kids since we don’t see much snow in Boulder City. We were able to go catch some of the arm wrestling contests. They wouldn’t let me compete (mainly because I wanted to compete against small ladies or children). 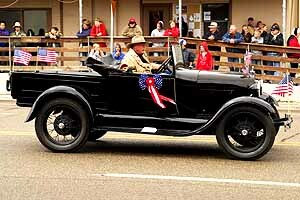 However, we did get to see more of the Pahrump Gunfighters. Although the weather did not cooperate, it was a great weekend. Also, please put out the word that the Mizpah is for sale and that we heard from a very good source that inside, it looks exactly as it did when it closed so many years ago – all the way down to the napkins and silverware in the Jack Dempsey Room. 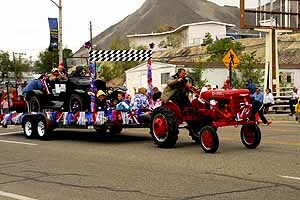 As you know, that building is probably one of the most significant and original pieces of Nevada boomtown history. It is a shame that people aren’t getting to walk in those halls anymore. The sign on the door said $1.7 million and the owners will carry the paper. There’s more, lots more, of Wells and its fascinating cast of characters that he brought to life. Then the February earthquake bucked beneath the old city and damaged the El Rancho badly, perhaps beyond repair. It devastated the block of Front Street that Gene and Peg had worked so hard to restore. They moved to a motel, and then to a hospital in Salt Lake City. And then he was gone. Thank you Gene, for caring so much and for doing so much. In my Bookbag — The Sea Gull by Linda Wada. The second was the 1926 production “The Sea Gull”, produced by Chaplin and directed by the then-unknown Joseph von Sternberg. It was never released, and in 1933 Chaplin burned the negatives. 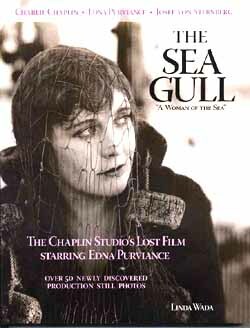 Little remained from the movie until author and Edna researcher Linda Wada, who has created an encyclopedic Edna Purviance website made contact with Edna’s grand-niece Ellie Hill and discovered, among other priceless Edna memorabilia, a set of more than 50 8×10 photos taken by an unknown photographer during the filming of “The Seagull”. “No words can ever describe my feelings at seeing these pictures for the first time, she writes in her heartfelt and authoritative book about the film and its participants. And indeed, the photographs are marvels of clarity and composition, revealing the story of the film, fleshed out in Wada’s commentary by excerpts from the shooting schedule, the title slides and other documentary sources from her research. This book fills a small niche in the Nevada bookcase, spotlighting a Nevadan we can all enjoy, via Netflix if no other way, and throwing light also on a film otherwise lost to history. Her book is beautiful, informative and edifying all at once. 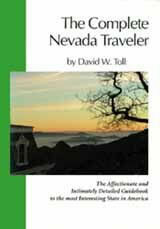 It is available at her website and at our online Nevada Book Store. 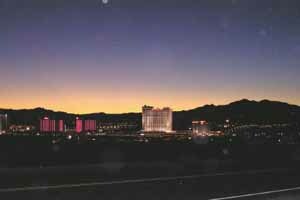 Laughlin, as seen from Arizona’s west coast. Artown, the nation’s most comprehensive arts Festival, bringing artists from down the street, across the country, and around the world for a month-long celebration of cultural diversity and artistic innovation. 350,000 people experience the more than 350 events. The Little Book of Artown, the free pocket guide covering the 31 days of July, for all that is Artown, is now available at the Artown office (300 E. Second St.), the Nevada Museum of Art, City Hall, (1 E. 1st. St.), and all Washoe County Libraries and U.S. Bank locations. Covering all 31 days of July, the Little Book of Artown is a one-stop guide to the more than 350 events held at more than 100 locations. The 2008 calendar boasts on average seven free events each day. 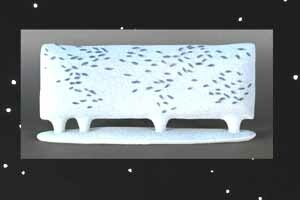 For more information call 775-322-1538 . . .
“Night Sky Reversed” Elaine Parks shows ceramics based on the night sky of northeast Nevada and other elements from this landscape in Hotel El Cortez, room 220, June 26-29. But you don’t even have to wait until July for art events in Reno. From noon to midnight June 26th – 29th 50 rooms of both classic Hotel El Cortez and TownHouse Motorlodge (2nd & Arlington) have been taken over to present a survey of what contemporary art in Nevada is doing, bringing some of Nevada’s hottest and brightest artists together at one time. You’re invited to enter these independent motel room/galleries hosted by the artists bringing art chaos and meaningless order at the Nada Motel . . . I don’t know if it’s art, but ‘Weird Al’ Yankovic, the king of pop parody, returns to the Henderson Pavilion (200 South Green Valley Parkway) by popular demand June 27 at 8 pm for a one night only concert from the ‘Straight Outta Lynwood Tour’. Weird Al will perform his greatest hits including “Like a Surgeon” and “Eat It.” Tickets are $26, $36 and $50; phone 702-267-4TIX . . .
Boulder City will soon be the home of Bootleg Canyon Flightlines, a new attraction which carries thrill-seekers down a series of overhead cables that start at the crest of the mountain range between Boulder City and Henderson. Bootleg Canyon Flightlines consists of a multi-run and multi-line series of lines that range in length from 1150 to 2550 feet. After guests assemble at the base for orientation, training will be provided on an 833-foot long practice run that will allow them an opportunity to become familiar with the system. The practice run will also give anyone having second thoughts a chance to back out before being committed to the full tour experience. But for most it will only heighten what lies ahead. Afterwards, groups of approximately 12 guests are shuttled up to the top of Red Mountain where they begin their descent on a series of 4 lines flying across canyons at speeds of up to 50 mph. The entire tour package will last approximately 2.5 hours and covers a total of 1.56 miles . . . The National Automobile Museum in Reno has the 1907 Thomas Flyer that won the 1908 New York to Paris Race on exhibit. The Museum is at 10 S. Lake St. in Reno and is open Monday – Saturday from 9:30 am to 5:30 pm, and Sunday from 10 a.m. to 4 p.m. Admission is $10 for adults, $8 for seniors and $4 for children 6 to 18 years. Children age 5 and younger are free, and so is parking . . . The Café at the Liberace Museum on Las Vegas offers “Lunch with Liberace” (a sandwich on a large croissant roll, chips, beverage and dessert) for $10, or a snack and beverage for $5 on Thursdays and Fridays. You don’t have to pay admission to the museum to stop by and have “Lunch with Liberace” or shop in the Museum Store. It’s best to call ahead to 702-798-5595 ext 14 or 15 to make sure it’s available when you want to visit.